The OCULUS TWINFIELD perimeter uses the principle of back-surface projection. Different projectors are mounted on a movable arm. Every position on the perimeter bowl can be accessed with this system. The stimuli are shown exactly, with precise reproducibility of test point locations – an essential condition for reliable visual field findings. Static perimetry with every type of test point grid as well as kinetic automatic and manual perimetry is now possible for the first time with this concept in a bowl perimeter. Not only static perimetry with classic or fast threshold measurement, but also suprathreshold examination with pre-programmed and customer-defined test point grids. 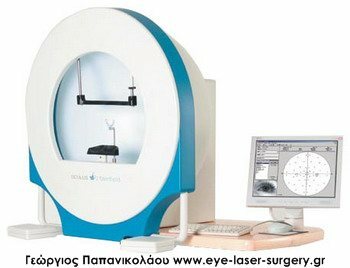 Automatic and/or manual kinetic examination for quick additional information and diagnosis confirmation. Red or blue stimuli can be presented both statically and kinetically on a white or yellow background. For daily routine in clinics and practitioners/ examinations, a follow-up program, and statistical analysis of results plus optional incorporation of Peridata, the statistics programme.